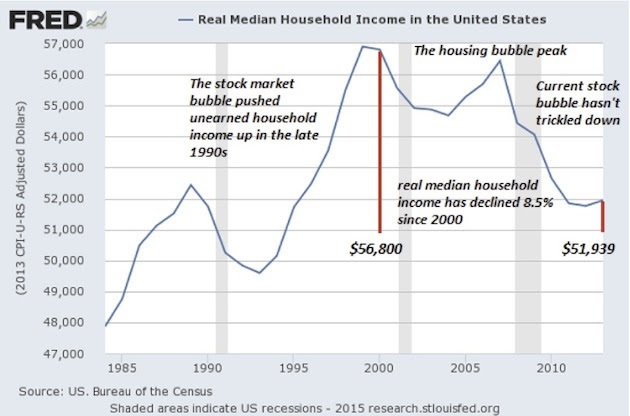 The chart shows median (not average) household income for the US, adjusted for inflation. Unlike average income, median income is not distorted by the enormous gains made by the one-percenters during the past decade. The chart shows that for a household in the center of the US income distribution, 1999 was the best year ever. The housing bubble brought median household income almost back to its 1999 level in 2007, but not quite. Today, median household income (adjusted for inflation) is slightly lower than it was in 1989, in the first year of the George H.W. Bush administration. How can this be? The economy is growing, and the US should have a squeaky-tight job market, since unemployment is at a 17-year low at 4.1%, a jobless figure that is near the definition of full employment. We’ve had seven straight years of job growth; job searches lasting 15 weeks or longer are now only 1.5% of the work force, down from 2% a year ago. But wage growth is anemic. According to the law of supply and demand, employers should be sharply bidding up wages in order to capture increasingly scarce workers. But they aren’t. In October, they raised wages just a bit more than inflation, at an annual rate of 2.4%, down from September’s rate of 2.8%. This is what imperial decay looks like to the middle class. Keep spending your seed corn tilting at windmills in the Middle East, and pretty soon some in the middle class are dumpster diving. And consider this: Only a little more than half of America has a retirement account, such as a 401(k) or Individual Retirement Account, according to the Federal Reserve. And the typical household with a retirement account had a balance of $60,000 last year, but there are big variations. Among the top 10% of households by income, the typical amount of savings was $403,000. Middle-income households had a median of $25,000. Everyone who isn’t in the top 10% knows just how bad things are, and those below the top 20% feel it every day. But what can they do about it? They work, many working multiple jobs. They get home exhausted. They’re too poor to run for office in a rigged plutocracy. So they go to bed and get up and go to work again in the morning, either depressed and angry, or simply depressed. That’s about all they can do, except to vote for politicians who have no intention of working to change their economic situation. Each resulting government is worse than the last. Not to mention at this point in terms of power over people’s lives, even the government is dwarfed by the power of multinational corporations. It’s long past time to wake up America! We’ve got to stop the hostile takeover of the middle class by plutocrats and corporations, but how to do it? We all have to get off the couch and work for local candidates who will be the bench strength of progressive politics down the road. We also must work to insure that our voting rights are not further eroded by polls that close early, or by efforts to prune the rolls of people who haven’t voted in a few years. This is particularly heinous when less than 55% of eligible people vote even in our presidential elections.